The town of Almora is characterised by the local slate stone used to construct houses and roads. It is also known for its temples, in particular the temple of Goddess Nanda Devi. 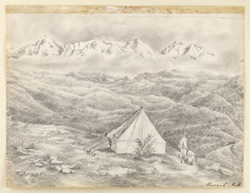 In the 19th century many hill stations developed in this area as cool retreats for European residents of the sub-continent wishing to escape the intense heat of the Indian plains during the hottest summer months.